With a history of agriculture, fishing and trading dating back thousands of years, Chad became independent from French colonisation in 1960. Civil war and military unrest occurred sporadically from then until the current president took office in 1990. For at least two decades, Chad has been significantly affected by the arrival of refugees from neighbouring countries, including Darfur in Sudan and the Central African Republic, and by people internally displaced by unrest within Chad. Chad is also involved in international anti-terrorism efforts to tackle Boko Haram and Al Qaida in the Islamic Maghreb. Most of Chad’s population depends on subsistence arable and livestock agriculture. Most of the population lives in the more humid south; the central and northern parts of the country are much drier and support only a sparse population. Cotton used to dominate industry and export earnings, and remains a primary export, but an oil industry has developed since 2000, with pipelines carrying oil exports to the Atlantic coast. GDP grew from 2003 to 2014, but global oil price falls led to recession in 2016. Chad also has gold and uranium deposits, but development of these is still very limited. Rainfall is highly variable both spatially and temporally across the country. Lake Chad is the major surface water resource, shared with neighbouring nations. Droughts in the 1970s and 80, combined with anthropogenic activity, reduced the area of Lake Chad to record low levels, placed huge stress on water resources, and increased dependence on groundwater. Most rural areas of Chad depend on groundwater for potable water supplies and often for livestock, and in the north, for small-scale irrigation, and groundwater is also an important resource in many cities. The low lying Lake Chad Basin covers much of Chad, with an elevation of about 250 m. There is also low lying land in the dry north of the country. To the north, east and south of the Lake Chad Basin, the land rises gradually to plateaus and mountains. The highest elevations are in the Tibesti massif in the north, at over 3000 m. In the east are plateaus lying at more than 900 m (United Nations 1988). Chad has a varied climate. In the south, rainfall is high - an annual average of 1000 to 1400 mm. In the central zone, average annual rainfall is between 700 and 1000 mm. In the north, the climate is semi-arid, with average annual rainfall between 200 and 700 mm. The far north is arid, with total annual rainfall below 500 mm. The dry northern zones have high evaporation of around 2200 to 2300 mm (United Nations 1988). 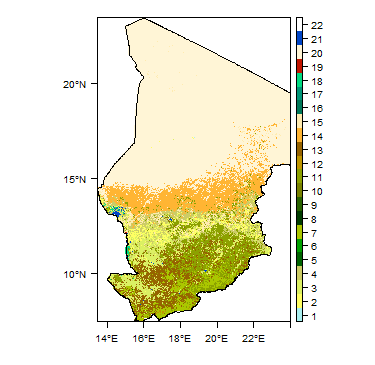 More information on average rainfall and temperature for each of the climate zones in Chad can be seen at the Chad climate page. Southern Chad is drained by two main perennial rivers: the Chari and its largest tributuary the Logone, both of which receive flow mainly from tributaries from outside the country. The Chari river drains into Lake Chad, which is the largest surface water resource in the country. The Lake Chad basin is one of the best studied in Africa, and is shared by a number of countries, including Chad, Niger, Nigeria and Cameroon. As well as the Chari river, it is fed by two other smaller rivers flowing from Nigeria and Cameroon. In the central and northern parts of the country, all the rivers are ephemeral, generally flowing only for a few hours after heavy rain, or at most for a few months each year (United Nations 1988). Land cover in Chad is largely controlled by climate. In the wetter southern zone, arable crops are and forest are widespread. In the central zone, arable crops and forest become rarer and land cover becomes dominated by grassland and savanna. In the dry north, vegetation is scarce (United Nations 1988). This section provides a summary of the geology of Chad. More information is available in the report ‘Groundwater in North and West Africa: Chad’ (1988) (see References section, below). The geology of Chad is dominated by the Lake Chad Basin, a sedimentary basin that started to form in the Mesozoic era. It is infilled with, at depth, Tertiary age sandstones and argillaceous sands of the Continental Terminal; and above these, Pliocene-Quaternary age sandy/clayey deltaic and lacustrine sediments (Ngatcha et al. 2008, UNICEF 2010). Other, smaller outcrops of unconsolidated Quaternary sediments - mostly alluvium in river valleys - occur in other parts of the country, overlying bedrock. Across the northern part of the country, to the north and east of the Lake Chad Basin, are older rocks, mostly Palaeozoic sedimentary rocks, largely of continental origin and dating from the Cambrian to the Jurassic. There are also small outcrops of Cretaceous age continental and marine sedimentary rocks. These Cretaceous and Palaezoic rocks are also present at depth in parts of central Chad, buried beneath Quaternary and Tertiary sediments in the Lake Chad Basin. There are some outcrops of volcanic rocks, particularly in the northwest, forming the Tibesti masasif. Precambrian metamorphic and crystalline basement rocks crop out in two main areas: one in eastern Chad and one in the northwest. Undifferentiated Quaternary Relatively small outcrops of undifferentiated unconsolidated Quaternary sediments occur across Chad, including alluvium in river valleys, and areas of aeolian sand dunes in the arid north. Chad Formation Quaternary-Pliocene Quaternary and Pliocene-Quaternary sediments, known as the Chad Formation, occur across most of the Chad basin. They consist of unconsolidated sediments of lake-margin, alluvial fan and deltaic origin, with some interbedded lacustrine clays. The Chad Formation is up to 500 m thick in Chad. Lacustrine clays are most extensive near to the present day lake shore (Goni 2008). The sediment lithology was controlled by the climate during deposition, with wet periods favouring the deposition of clays and diatomites; periods of alternating wet and dry seasons tending to produce sandy deltaic deposits; and dry periods favouring the formation of aeolian sand dunes. The deposits therefore range from pure sand to clayey sand, and include some kaolinitic clays. Abrupt changes in clay and sand content are common, and the sediments usually occur as overlapping lenses. Continental Terminal; also a small area of Eocene marine deposits in northern Chad Tertiary: Eocene, Oligo-Miocene, Neogene The Oligo-Miocene to Neogene Continental Terminal Formation occurs across large parts of southern Chad, in the Lake Chad Basin. It consists of alternating sandstone, argillaceous sand and clay layers. They are generally at depths of 400 to 700 m, below the Quaternary-Pliocene Chad Formation. In some parts of the south and southeast of the Lake Chad Basin, the Continental Terminal rocks crop out at the ground surface, shown on the geology map. Cretaceous There are few outcrops of Cretaceous rocks at the ground surface in Chad, but they occur at depth in the Lake Chad Basin. The Lower Cretaceous is characterised by continental fluviatile and lacustrine clastic rocks, part of the Permo-Triassic to Lower Cretaceous age Continental Intercalaire Formation. The Upper Cretaceous includes marine to continental clastic rocks, including fossiliferous shales. Mesozoic to Quaternary There are a few isolated small outcrops of igneous rockos in the east and south of the country, of which little is known. The largest outcrop of igneous rocks is in the Tibesti massif, which are thought to be dominantly Tertiary to Quaternary volcanic rocks, mainly lavas but also including some tephra and other volcaniclastic rocks (Permenter and Oppenheimer 2007). Cambro-Ordovician - Jurassic Palaeozoic and Lower Mesozoic continental sandstone sequences crop out over a large part of northern Chad, and are known to be present at depth below younger deposits in the Lake Chad Basin in the centre of the country. In the north, this includes the Kufra basin, with largely Cambrian to Carboniferous rocks, which is shared with Libya and the Sudan. Thick continental sandstones within the Kufra basin form the Nubian formations, which are at least 1000 m and possibly up to 4000 m thick. Precambrian Granitic and crystalline rocks forming the higher mountain areas in the north, east and south. This section provides a summary of the hydrogeology of the main aquifers in Chad. More information at a country-scale is available in the report ‘Groundwater in North and West Africa: Chad’ (1988) (see References section, below). For areas where the ResEau program has produced hydrogeological maps and descriptions, these provide the most detailed available information on groundwater and hydrogeology (see below). The hydrogeology map shown on this page shows a simplified version of the type and productivity of the main aquifers at a national scale (see the hydrogeology Map resource page for more details). A digital map of hydrogeological units is held by the Chad Direction Nationale de l’Hydraulique (UNICEF 2010). A hydrogeological map at 1:500,000 scale was published in 1969 by BRGM and a scanned copy can be viewed on the WHYMAP site. The ongoing ResEau program is collecting detailed new hydrogeological information and producing new hydrogeological maps for Chad. Eventually, the whole country will be covered at 1:500,000 scale, and already these scale maps are available for the north and east of the country. More detailed hydrogeological maps at 1:200,000 scale are being produced for specific important areas. Digital versions of these maps can be viewed in the ResEau geoportal. Pdf versions of the maps, with accompanying hydrogeological descriptions, can be freely downloaded from ResEau. A detailed synthesis of the hydrogeology of the north and east of Chad is available as a report (in French). 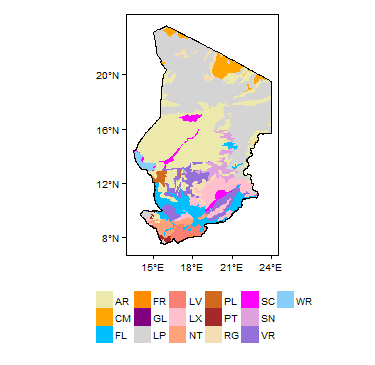 These maps and descriptions are the key source for information on the hydrogeology of Chad. 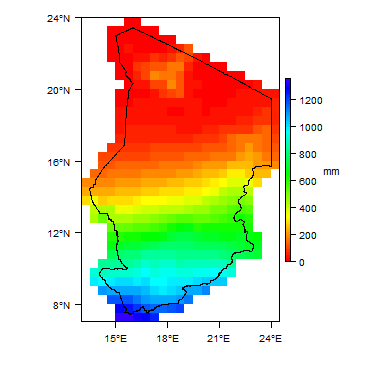 The information below provides a summary of the hydrogeology of Chad at a national scale. The Lake Chad Basin in southern Chad is one of the largest sedimentary groundwater basins in Africa. It includes three main aquifers: an upper, unconsolidated Quaternary/Pliocene aquifer of lacustrine and deltaic deposits (the Chad Formation); a Tertiary sequence underlying this (the Continental Terminal formation); and a basal aquifer of Cretaceous age, which is less well understood. Away from the Lake Chad Basin, other aquifers in Chad are not as well studied or understood. Other aquifers include Quaternary valley alluvium and other unconsolidated sediments; Palaeozoic sedimentary rocks in the north, part of the Nubian Sandstone Aquifer System; Precambrian basement rocks; and smaller areas of volcanic rocks. Alluvium in river valleys; aeolian sand in the north Usually Moderate to High Outcrops of Quaternary alluvium in major river valleys are likely to be permeable and to have high groundwater storage potential, and shallow water tables. Where they are hydraulic connection with groundwater in underlying bedrock, such as weathered Precambrian basement, they can contribute significantly to local groundwater potential. Chad Formation: Quaternary (to Pliocene) - upper part of the Lake Chad Basin Aquifer High The Pliocene-Quaternary Chad Formation aquifer within the Lake Chad Basin is dominated by permeable sands that are present at depths of up to 500 m; the top surface of the aquifer varies from 250 to 350 m. Clays are most extensive near to the present day lake shore (Goni 2008). The upper part of the aquifer is often unconfined but in some places semi-confined to confined by clay layers (Goni 2008), and in its shallowest zones is in direct hydraulic contact with the Logone-Chari river system and with Lake Chad. Parts of the lower aquifer are confined by clay layers, and under artesian pressure. Sub-aquifers are identified within the overall basin, including the Kanem, Koros and Chari-Baguirmi areas. Borehole yields of 2.5 litres/second (l/s) have been recorded (United Nations 1988), but it is likely that much higher potential yields are possible. 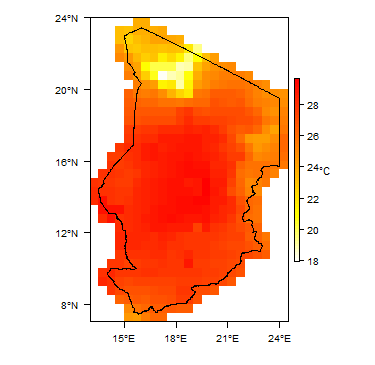 Isotopic studies have highlighted recharge zones to the shallow aquifer in areas of higher elevation and in exposed sand dune areas; as well as infiltration from rivers Lake Chad and wetlands (GWP 2013). In the northern part, in Kanem region, studies have also show high recharge from the slopes of the mountain areas to the north. In the centre of the basin, groundwater levels are typically deepest - often more than 25 m below ground level - although it is not clear whether these relate to the Chad Formation or to the deeper Continental Terminal aquifer (see below). They tend to shallow towards the west of the basin, to between 10 and 25 m deep; and even more towards the southern edge of the basin, often to less than 5 m deep (UNICEF 2010). Groundwater is abstracted for domestic use and livestock watering through hand dug wells (in the shallow aquifer) and boreholes. In the Chad Formation aquifer there are areas of high nitrate concentrations linked to agriculture discharges and faecal contamination. High fluoride concentrations are also seen. Groundwater in parts of the northern Kanem region contains high concentrations of sodium carbonates and sodium sulphates. Continental Terminal: Tertiary - lower part of the Lake Chad Basin Aquifer Moderate to High The alternating sandstones and clay rich bands of the Continental Terminal underlie the Pliocene-Quaternary Chad Formation; together they form the Lake Chad Basin Aquifer. The Continental Terminal lies at depths of between approximately 100 to 200 m up to 400 to 600 m. It is artesian, confined by overlying clay bands. Average borehole yields are high, given as 27.5 l/s (United Nations 1988). Isotopic studies suggest that groundwater in the Continental Terminal aquifer in the Lake Chad Basin is at least 20,000 years old and is not replenished by modern recharge (GWP 2013). Groundwater is abstracted for drinking water in rural and urban areas, but extraction costs are considerable. High fluoride concentrations in groundwater are seen. Continental Intercalaire: Cretaceous Unknown This aquifer occurs at depth in the Lake Chad Basin in southern and central Chad. Relatively little is known of its properties in Chad. Nubian Sandstone: Palaeozoic to Mesozoic Moderate to High The Nubian Sandstone aquifer in the Kufra basin is at least 1000 m and possibly up to 4000 m thick, and is dominated by well-cemented sandstones, with intercalations of shales and clays. Groundwater flow is largely through fractures but also by intergranular flow. The Nubian Sandstone aquifer system as a whole, which extends across much of north Africa, forms a productive aquifer which contains huge volumes of largely fossil groundwater. Little specific investigation has been done on the aquifer in Chad. Groundwaters vary from fresh to slightly brackish, with salinity ranges from 240 to 1300 ppm. High concentrations of ions including sodium, chloride, and sulphate reflect the leaching and dissolution processes of gypsiferous shales and clay, in addition to long groundwater residence times. Probably Low to Moderate Little is known about the aquifer properties of volcanic or other igneous rock aquifers in Chad. Weathered basement, often in hydraulic continuity with overlying Quaternary alluvial sands Low In deep valleys in the granitic massifs, the upper parts of the Precambrian rocks can be heavily weathered. These weathered basins form low to moderate productivity aquifers, especially where they are in hydraulic continuity with overlying permeable Quaternary sands, which supply additional groundwater storage. The Lake Chad Basin aquifer has been widely studied and it is clear that it is highly sensitive to climatic changes (GWP 2013). Recharge to the aquifer has decreased in recent years, mainly due to drought, but also related to management decisions in upstream regions. Because recharge is derived from surface water (river and lake) infiltration as well as from direct rainfall infiltration, the decline in river flows and inflow to the lake (of nearly 50% since the 1960s) has had significant impact on groundwater recharge (GWP 2013). A recent project by BGR found that point source nitrate pollution of groundwater was a concern around boreholes where livestock are watered in the Lake Chad area, with groundwater nitrate values up to 350 mg/l measured in some boreholes. This is thought to be caused by direct contamination of abstraction bucket ropes, and therefore of boreholes, by livestock faeces, rather than the infiltration of nitrate into groundwater (Vassolo et al 2009). Recent information states that nearly 80% of groundwater abstracted in Chad is used for agriculture, and around 20% for domestic use (Global Water Partnership, 2013). Many rural areas, particularly in the drier north, depend on groundwater from shallow hand dug wells and boreholes for domestic use, and in some cases also for livestock use in dry seasons. Groundwater is also used for small scale irrigation in the north. Groundwater also provides a large proportion of water supply in many urban centres, including N'Djamena (United Nations 1988). A small number of industrial users also abstract groundwater, including for textile manufacture, sugar refining, cotton milling and brewing. There is a national database of water points stored in the Direction de Nationale de l’Hydraulique, which has information on more than 10,000 boreholes and wells across Chad (UNICEF 2010). No geological log information for boreholes is available, and water chemistry/quality data are generally not recorded, but the rest (static) groundwater level is recorded for many of the boreholes. Information from the water point database was used by UNICEF (2010) to produce a map indicating rest water level (depth to groundwater). The Lake Chad Basin aquifer is shared between eight countries, including Chad, Niger, Nigeria and Cameroon. The Lake Chad Basin Commission (LCBC), based on the “Convention Relating to the Development of the Chad Basin” signed in 1964, was created in order to regulate the management of transboundary natural resources. Cameroon, Niger, Nigeria, Chad and the Central African Republic are members of the LCBC, and Sudan was granted membership in 2000 but has not yet ratified the convention. The commission is responsible for regulating and controlling water and natural resources uses in the basin, including groundwater management. To date, few groundwater programs have been implemented, but the LCBC has recognised groundwater importance and made efforts to fully include groundwater in its activities (GWP 2013). The Nubian Sandstone Aquifer occurs in the Kufra basin in northern Chad, and is shared with Egypt, Libya and Sudan. The Observatoire du Sahara et du Sahel (OSS) coordinates the management and protection of groundwater in the Nubian Sandstone Aquifer, as well as other major aquifer basins in the region. Related international agreements include the Programme for the Development of a Regional Strategy for the Utilisation of the Nubian Sandstone Aquifer System (NSAS) - Terms of Reference For the Monitoring and Exchange of Groundwater Information of the Nubian Sandstone Aquifer System, signed in Tripoli in 2000. Information on major groundwater projects in Chad, including links to project results and outputs, can be found on the Chad Groundwater Projects page. The following references provide more information on the geology and hydrogeology of Chad. BGR (Federal Institute of Geosciences and Natural Resources). 2017. Supraregional Africa: Groundwater Management of Lake Chad Basin. Project website, 11 April 2017. Danert K. 2015. Professionalising Manual Drilling: Chad’s Growing Manual Drilling Industry. RWSN, UNICEF, Skat Foundation. GWP (Global Water Partnership). 2013. The Lake Chad Basin Aquifer System. Global Water Partnership Transboundary Groundwater Fact Sheet, compiled by F Bontemps. Ngatcha BN, Mudry J and Leduc C. 2008. The state of understanding on groundwater recharge for the sustainable management of transboundary aquifer in the Lake Chad Basin. Presentation at 4th International Symposium on Transboundary Water Management, Thessaloniki, Greece, 15-18 October 2008. Permenter JL and Oppenheimer C. 2007. [http://pages.mtu.edu/~raman/papers2/Parmeter&OppChadBV.pdf Volcanoes of the Tibesti massif (Chad, northern Africa). Bull. Volcanol. 69, 609-626 . Doi: 10.1007/s00445-006-0098-x. Practica Foundation, UNICEF and Enterprise Works/VITA. 2009. The impact of manual drilling for the construction of sustainable water-points in Chad. Scheider JL and Wolff JP. 1969. Carte Hydrogeologique de la Republique du Tchad; Scale 1:500 000. Bureau de Recherches Geologiques et Minieres (BRGM), Orleans. Thorweihe U and Heinl M. 2002. Groundwater resources of the Nubian Aquifer System NE Africa. Technical University of Berlin: Modified synthesis submitted to Observatoire du Sahara et du Sahel (OSS, Paris) 1998: Aquifers of major basins - non renewable Water Resource Groundwater Resources of the Nubian Aquifer System. United Nations. 1988. Chad: in Groundwater in North and West Africa. United Nations Department of Technical Cooperation for Development and Economic Commission for Africa, Natural Resources/Water Series No. 18, ST/TCD/5. Vassolo S, Bila M, Hamit A. 2009. A review of the groundwater situation in the Lake Chad Basin. Lake Chad Sustainable Water Management Project Activities - Report N° 2. Federal Institute of Geosciences and Natural Resources (BGR), Hanover. This page was last modified on 18 February 2019, at 11:33.